Posted at: 6/03/2010 04:32:00 PM . 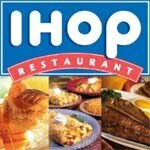 IHOP's new Pancake Revolution is a great promotion to sign up for on Facebook. Once you like IHOP and sign up, you'll get a free meal. You'll get another free meal on your birthday, and a third free meal on the one year anniversary of you joining the revolution.